One of the most common types of child custody cases seen by parents, judges, and attorneys these days is the situation where an unmarried couple has a child, splits up, and one of the parents refuses the other parent contact with the child. Very often the parent who is not permitted to see the child will attempt to involve law enforcement only to be told that without a court ordered visitation plan there is nothing that can be done to force the other parent to permit contact between that parent and the child. Thus the petition to establish paternity for child custody has become one of the most common types of custody cases. Most often unmarried parents who break up will attempt to go for some period of time on a verbal agreement for visitation between the parents. Sometimes this works well for a while, however, when the new boyfriend or new girlfriend comes into the picture or there is some sort of disagreement between the parents over a parenting decision then the verbal agreement will usually break down ending with one parent being severely limited on contact with the child forcing that parent to take court action. How Can a Parent Legally Not Let the Other Parent See Their Child? In most states in the U.S. unmarried fathers do not posses the same parental rights over their children that married fathers do until those rights are granted by a judge via court order. Until the unmarried father gets his court ordered parental rights then the mother will have sole parental responsibility and thus be able to dictate visitation. of course if mom keeps the child away from a safe and loving father then the courts will frown on her for doing this, but if dad never files for his parental rights then mom will forever call all the shots. 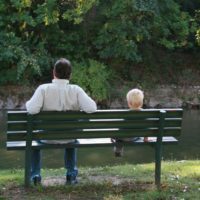 Every day we hear stories about unmarried fathers who are completely shut out of their child’s life for an array of different reasons including allegations of past drug use, past domestic violence, previously not being an active part of the child’s life, or just stating that the father is not “responsible enough” to be given any time-sharing with the child. When a parent is placed in this position the legal mechanism that they have at their disposal is to open a child custody/visitation case which in many areas of the country is referred to as a “paternity petition”. This is a new court case like any other where the person filing must pay a filing fee, have the other party served with the court documents, they would then have a set time to file a written answer, and so on. “The public needs to be educated as to the legal maze that faces unmarried parents” Sean Smallwood. ESQ. Why Can’t I See My Child Even Though I Am Ordered to Pay Child Support? Another painful part of this process for many is where the state Department of Revenue goes after a parent for child support. Most of the time these administrative child support courts do not have authority to give orders for visitation and only order child support. Many parents take the position that they will not pay their child support until they are permitted to see the child which usually ends with that parent learning harsh lessons about the strict enforcement powers of the child support hearing officers for non-payment. Parents who do not keep up with support often find themselves with suspended drivers licenses, suspended professional licenses, suspended passports, levied bank accounts and tax returns, and jail. The worst part about being caught in this cycle is that the parent ordered to pay child support is usually paying substantially more than they would if they had any court ordered visitation. This is because in most states child support is calculated using a math figure that takes into account the incomes of the parents and the amount of court ordered visitation that each parent has with the children. At the end of the day, payment of child support is not dependent on getting visitation which means that a parent can be pursued for child support to the furthest extent of the law and still not be permitted to see their children. When this happens to a person who cannot afford to hire an attorney or someone who just is not aware of the law and what to file, it can be a devastation cycle of depression, debt, and jail. Will the Judge in My Paternity Case Let Me See My Child If We Go to Court? Most courts and judges subscribe to the notion that it is in a child’s best interests to have an open and frequent contact with both parents unless to do so would be some detriment to the child. Many times a paternity case will go to court and a mother who did not have a good reason to refuse to permit the other parent to see the child will actually be given less time with the child due to their refusal to follow the child’s best interests in permitting the other parent to see the child. of course this is heavily dependent on the facts of the case and how well the case is presented in court. In conclusion the paternity case is a highly complicated type of child custody case and should not be undertaken without the assistance of a legal professional. the largest reason why so many parents are afflicted by the above stated hypothetical sets of facts is a lack of knowledge of the general public. if we work to educate the public on these issues then far less parents would go without seeing their children and child support payments would be more reasonably affordable to parents who are ordered to pay by entities such as Departments of Revenue. Thus the instances of non-payment would be reduced lessening the need for the states to spend so much money each year in enforcement efforts.